Once you add all your ingredients and lock the lid to seal a pressure cooker, you'll find that you can prepare a delicious meal, and get it on your table quickly. 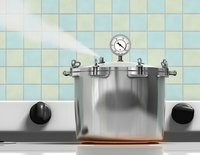 When the liquid inside the cooker comes to a boil, it produces steam that increases the internal pressure in the cooker. As a result, water boils at 250 degrees Fahrenheit instead of 212 F. This increased boiling point lets you cook up to 70 percent faster while tenderizing even tough cuts of meat. When you're shopping for a pressure cooker, you'll find that there are two types: electric and stovetop. Stovetop models are typically less expensive, but they require frequent monitoring to maintain the right level of pressure. Electric models regulate the pressure for you. Look for a pressure cooker that holds at least 6 to 8 quarts and reaches 14 to 16 pounds per square inch at its high pressure setting. Another important feature is the lid -- make sure you buy a model with a lid that's easy to lock in place. Other nice features include heat-resistant handles, a three-ply heavy bottom to prevent scorching and an easy-to-read pressure regulator. Many types of food can be cooked in the pressure cooker, although it's particularly helpful when cooking foods that require long cooking times or tough cuts of meat. The high pressure inside the cooker increases the heat, which speeds up the cooking process of foods such as grains, legumes or root vegetables. The increased pressure also infuses food with moisture, which tenderizes otherwise tough foods such as rump roasts or other tough cuts of meat. Many other types of food can also be pressure-cooked. For example, the pressure cooker maintains the texture of tender vegetables and it can be used to make soups, stews and more. Once the food has finished cooking, you need to release the pressure before opening the lid. The fastest of three ways to achieve this is the cold water release method. which works best for foods with very short cooking times. Like its name implies, this method uses cold water run over the outside of the cooker and the lid to reduce the pressure. The quick release method releases pressure by having the user deploy a special valve designed for instances when you need to quickly stop cooking, such as when you need to add more ingredients before bringing the pressure back up. The natural release method involves removing the heat from the cooker and waiting approximately 10 to 15 minutes for the pressure to subside. When used according to the manufacturer's instructions, pressure cookers are very safe. Although the cookers have built-in safety mechanisms to minimize the risk of kitchen disasters, it's still important to follow a few safety rules. For example, in most instances, it's best to avoid filling a pressure cooker more than 2/3 of the way to the top. Always check the vent to be sure that it's clear before cooking. Additionally, read the manufacturer's instructions before using your cooker since the exact operation differs among brands and models.